This unique tablet has broad appeal across many industries with in-field workers including: archaeologists, forensic specialists, and oil & gas professionals, architects, engineers, and construction workers. Are there other rugged tablets on the market that provide cutting edge precision measuring with 3D image capture? There are other rugged tablets with 3D cameras, but the DT380Q is the only tablet on the market today with both fully integrated 3D image capture and GNSS positioning in such a small form factor. Why was the built-in Intel® RealSense™ Depth camera chosen for the option on this tablet? After considering other image capture technology, we found that the Intel RealSense camera offers the best combination of indoor/outdoor performance, hardware form factor for tablet integration, and price competitiveness. 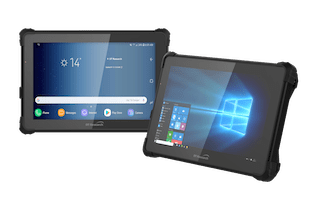 Are there other rugged tablets that offer concurrent reception of GPS and GLONASS the optional high quality U-blox M8 GNSS module for accurate positioning? Yes, we offer a line of 10 inch rugged tablets with high accuracy positioning capabilities. In fact, our 301TR offers concurrent, dual frequency reception for RTK (real-time kinematic) accuracy. Why was this option selected? The U-blox M8 GNSS module delivers adequate positioning for most applications and fit the hardware form factor for tablet integration, while also offering cost competitiveness. What is the price point compared to other comparable tablets, if there are any? Other rugged tablets with 3D cameras typically cost more than $2,500 and do not include GNSS capabilities. The DT380Q with both 3D image capture and GNSS positioning will MSRP under $1500. What were the features that customers most wanted to see in a rugged tablet that you have incorporated into the DT380CR and DT380Q? Customers are most excited about the combination of Intel RealSense 3D camera with uBlox GNSS, plus the standard features our customers have come to expect from a DT Research rugged tablet, such as high bright LCD and hot-swappable batteries. What are the differences between the DT380CR and DT380Q? The DT380Q offers the option of the 3D camera and runs on the Android 9 operating system. The DT380CR runs Microsoft® Windows® 10 IoT Enterprise. The hardware form factor and other features are the same for both tablets. The DT380Q tablets include the latest 3D real-time imaging technology through an optional built-in Intel® RealSense™ Depth camera that can scan and capture highly accurate weight, volume and dimension measurements for a variety of construction, logistics and warehousing projects. DT380CR and DT380Q tablets are available immediately from DT Research’s authorized resellers and partners. Continuous Operation – Hot-swappable batteries, battery pack, battery gang charger, and desktop charging cradle. This entry was posted on Friday, April 12th, 2019 at 1:10 am. You can follow any responses to this entry through the RSS 2.0 feed. You can leave a response, or trackback from your own site.